MONDAY, March 28, 2016 (HealthDay News) -- Painful ear infections remain a scourge of childhood, but fewer American babies are getting them now compared with 20 years ago, new research shows. The study didn't dig into the reasons for the decline. But experts say the credit likely goes to certain childhood vaccines, rising rates of breast-feeding and the drop in Americans' smoking rate. The new research found that 46 percent of babies followed during 2008 to 2014 had a middle ear infection by the time they were 1 year old. But while the infections were common, those rates were lower when compared against U.S. studies from the 1980s and '90s, the researchers added. Back then, around 60 percent of babies had suffered an ear infection by their first birthday, the study authors said. The decline is not surprising, according to lead researcher Dr. Tasnee Chonmaitree, a professor of pediatrics at the University of Texas Medical Branch, in Galveston. "This is what we anticipated," she said. That's in large part because of a vaccine that's been available in recent years: the pneumococcal conjugate vaccine, Chonmaitree said. The pneumococcal conjugate vaccine protects against several strains of pneumococcal bacteria, which can cause serious diseases like pneumonia, meningitis and bloodstream infections. Those bacteria are also one of the major causes of children's middle ear infections, Chonmaitree said. She added that yearly flu shots, which are now recommended for children starting at the age of 6 months, are probably helping, too: Ear infections often arise after a viral infection like the flu or common cold, the study authors said. Vaccinations "could very well be one of the drivers" behind the decline in infant ear infections, agreed Dr. Joseph Bernstein, a pediatric otolaryngologist who wasn't involved in the study. But there are other important factors, too, both he and Chonmaitree said -- namely, rising rates of breast-feeding and a decrease in babies' exposure to secondhand smoke. "The data really do suggest that breast-feeding -- particularly exclusive breast-feeding in the first six months of life -- helps lower the risk of ear infections," said Bernstein, who is director of pediatric otolaryngology at the New York Eye and Ear Infirmary of Mount Sinai, in New York City. Why does breast-feeding matter? The main reason, Chonmaitree said, is that breast milk contains antibodies that can help protect babies against infections. There's also the fact that breast-fed babies are less likely to spend time drinking from a bottle while lying down, Bernstein noted. That position can make some infants more vulnerable to ear infections, he said. The study findings were based on 367 babies followed during their first year of life. By the age of 3 months, 6 percent had been diagnosed with a middle ear infection; by the age of 12 months, that had risen 46 percent, researchers found. Not surprisingly, babies with ear infections also suffered more colds during their first year -- almost five, on average, versus two among babies who didn't develop an ear infection, the study authors said. 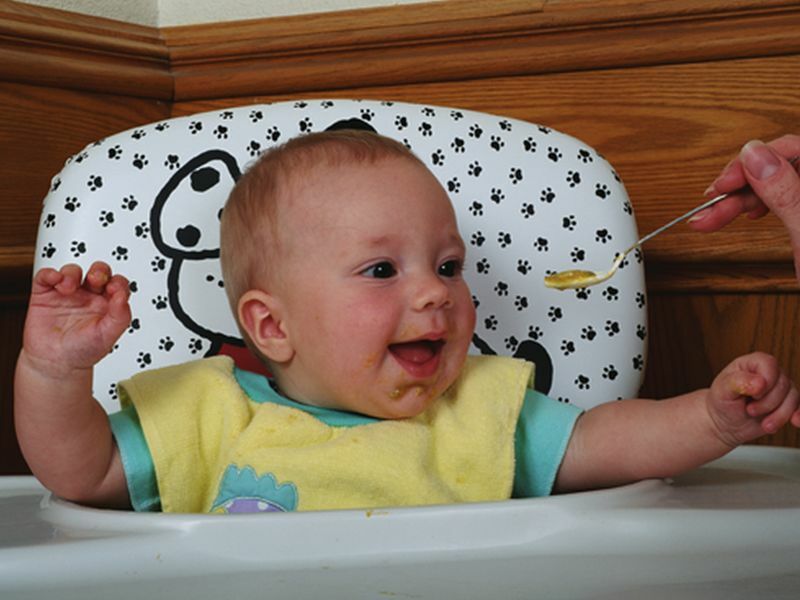 Breast-fed babies had a lower ear infection risk, however. Those who'd been exclusively breast-fed for at least three months were 60 percent less likely to develop an ear infection in their first six months, the study showed. To Chonmaitree, the findings underscore evidence that breast milk is the best nutrition for babies. "Breast-feeding is good," she said. "Parents should be encouraged to do it if they can." Bernstein stressed the "if they can" part. Some mothers, he noted, simply can't exclusively breast-feed for a long time -- because of work or other reasons. But whether babies are breast-fed or not, they will benefit from routine vaccinations, Chonmaitree said. "Parents should make sure they're on schedule with the recommended vaccines," she said. According to the American Academy of Pediatrics (AAP), most children with middle ear infections get better without antibiotics, and doctors often recommend pain relievers -- like acetaminophen -- to start. But with babies, Bernstein said, antibiotics are often used right away. The AAP recommends antibiotics for infants who are 6 months old or younger, and for older babies and toddlers who have moderate to severe ear pain. The study was published online on March 28 in the journal Pediatrics.